Why do you want to make your own wiring harness? As I understand it, the way the wiring works for the factory head unit (IS300 for those that are just joinging us) is HU > amp > speakers. Each ">" is a connector. I think I am leaning towards leaving the factory front stage in for a bit and just adding a sub and head unit, which means I could just wire up a wiring harness that goes straight from the aftermarket head unit to a female amp "connector" that I can't seem to find, and into the original connector OUT of the amp to the rest of the system. That way I bypass the stock amp, have active control of my factory front stage from the head unit, and I can return everything to stock in about 15 minutes if needed. Also it means I don't have to run wire to the doors. Sorry to go so OT in a thread about the AEIB15. I hear it's a pretty sweet sub! Just trying to decide how much output I need on whether I can go IB12 or IB15. I've never had an infinite baffle in a trunk setup before, so I know I have to be a little bit more careful with overexcursion than I have been in the past. I am still getting a lot of PMs about this thread all the time. There are a few things I should point out for viewers. The IB series is disconitnued. John at AE is selling an upgraded version for a bit more, not sure how much, if anybody wants to look it up post it here. I recommend the AE AV series over the IB or the upgraded one for users that don't mind extra weight. The AV series is likely to perform quite a bit better at the cost of 17lbs extra, 32lbs total. High: AMT line array;Mid: SS 25W/8567-SE 10";Low: 4x Seas L26RO4Y 10"
AV line is pretty much on hold right now too. The IB replacements are about $100 more than the IB Line was. You're about 3-6 years too late buddy. They are good for a variety of applications- including sealed box, however they do require more airspace than some which are designed for smaller sealed boxes. They likely have higher sensitivity than those other subs though too, so trade-offs. If you think you may do IB down the road, I would recommend it since it can perform well in both scenarios. Sealed box subs are a whole 'nother animal. What I look for in sealed box subs are powerful motors and stiff suspensions. The system has to have a low Q and suspension that can withstand box pressure without rocking modes. I know we usually want high Xmax as well, and that's nice to have but that's usually a function of how much SPL you want. You can also use multiple low xmax woofers. No matter what you do have to have the motor and the suspension for it. I recommend Seas Design for basically any sealed box arrangement. I don't think there is a better choice out there. 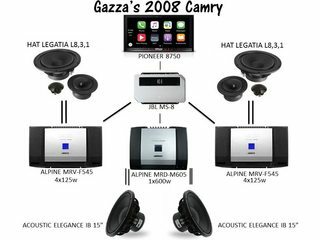 I also use these 12 IB AE subwoofers in my car and from my experience they required quite a lot of air to work properly. In my case that meant they would sound worse with 3 in my trunk than with 2 (IB configuration). The trunk just wasn't big enough for the 3 of them.